Church services to commemorate the victims of the war in South Ossetia are held in Abkhazia. Many in the Republic think that if Georgia had achieved its plan to crush South Ossetia, they would have been the next target. Neighbouring Abkhazia is another country, alongside South Ossetia. Georgia still sees both as part of its territory. Hundreds of worshippers gathered here in Afon, inside Abkhazia’s main Christian orthodox cathedral, in grief and in prayer for the victims of last year’s attack on South Ossetia. Besides Abkhazians, there are Russian tourists who spend their vacation in the republic. Most of them are not afraid to visit Abkhazia now, but in August last year there were few visitors, since Georgia had plans to invade its former breakaway territory. According to these plans, the attack could have been carried out from the sea, from the Kodori gorge, where Georgian special forces were building their heavily fortified lines of defense. Most people in Abkhazia were almost certain that if Georgia succeeded in conquering Tskhinval, their republic would have been next. “Of course as we, the people of Abkhazia, are marking this anniversary along with the people of South Ossetia, this treacherous act by Georgian President Saakashvili will remain in our memory,” said Sergey Shamba, the republic’s foreign minister. Military intelligence issued a warning that Georgian army was planning to invade Abkhazia from the sea. Another possibility was that the enemy will come from the Kodori gorge, an area, that Georgian special forces entered in 2006, violating international peace agreements. On August 9 last year, the Abkhazian army launched a preventive attack against Georgian troops in the Kodori gorge. In just three days time, the valley was secured. But even at that time, everyone was trying to keep calm, and make the guests at the Abkhazian resorts feel more secure. “There were a lot of tourists, people on vacation, it was our peaceful Abkhazia, but we had a military mission to accomplish,” Daur recalls. Georgian troops quickly fled their heavily fortified trenches, leaving behind tons of guns and ammo. Abkhazian soldiers say they are thankful to NATO instructors who taught the Georgians to retreat so fast. “It was like this: the Abkhazian air force bombed the Georgian positions in the early morning and unfortunately we failed to catch even a single Georgian soldier,” Daur explains. Soldiers who spoke to RT said they discovered literally tons of weapons and munitions in Kodori, primarily NATO brands made in Israel and the US. Most of that arsenal had to be destroyed on site. In the meantime, Russian warships arrived to protect Abkhazia from the sea, by request of local authorities. Abkhazia was then recognized by Russia as an independent state and the two counties signed treaties on military cooperation. Russian ships have since been on display in the Bay of Novy Afon much more often. Luckily there were no victims in last year’s Kodori operation, since many Georgian troops fled the valley without fighting. So today the Abkhazians are mostly praying for their Ossetian brothers, for those who lost their loved ones during the 2008 conflict. The republic still has close ties with South Ossetia, since they share common history and a common threat from Saakashvili’s administration. 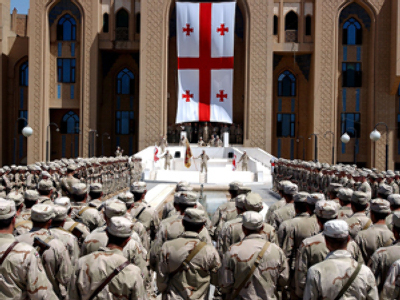 And even though the border between Abkhazia and Georgia in the Gali district is now secure, people still fear that Georgia’s Western ally may be actively rearming the current regime in Tbilisi and that they may face new threats in the future.